I wish you a wonderful 2014! My family spent our New Years Eve at Saddleback Butte State Park. Our affair was a private one. Only the four of us were invited. Our event cost us $1.60 for the gourmet Cup of Noodles dinner. We rocked out to the melodic stylings of The Musical Road. It was an epic party! We packed a cooler full of fruit, ham sandwiches (thank you Christmas leftovers), candy, and chips, stopped by Dollar General for $1 3-packs of Cup of Noodles then headed for the Mojave desert. First stop, “The Musical Road”. I didn’t realize until Wikipediaing it that only about five musical roads exist throughout the world and the only one in America is right here in our backyard. It plays a loose interpretation of the William Tell Overture when you drive over it at 55 miles per hour. We were the geeks driving around in circles playing the road over and over around noon on New Years Eve. Then we buzzed on over to Saddleback Butte State Park, which apparently used to be named Joshua Tree State Park until everyone got tired of confusing it with Joshua Tree National Park just a few hundred miles away that they gave it up and changed the name to Saddleback Butte. We went on a gorgeous desert hike up to Little Butte. My youngest son, who is 7 years old, wanted to hike the extra mile or so straight up the mountain to Saddleback Peak, and I secretly wanted to do it too but my husband wisely assumed the voice of reason and put the kibosh on the whole plan cautioning us to quit while we are ahead and have enough daylight to end the day warm and happy. He was right. Being happy with Little Butte gave us plenty of time to play football and frisbee, explore the ruins of a stone cabin, and cook dinner before the sun went down and the temperature started to plummet. 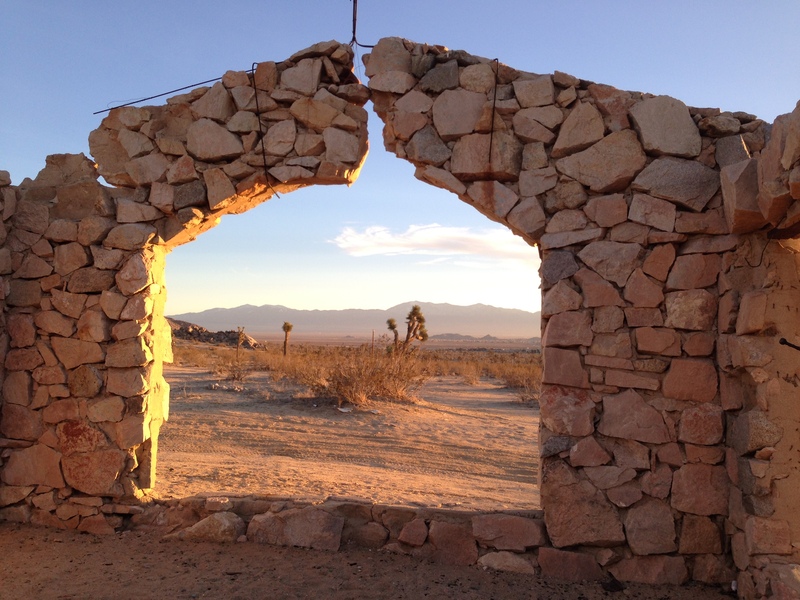 May I implore you to make a trip to the desert sometime during the winter months. The desert is so pleasant this time of year. 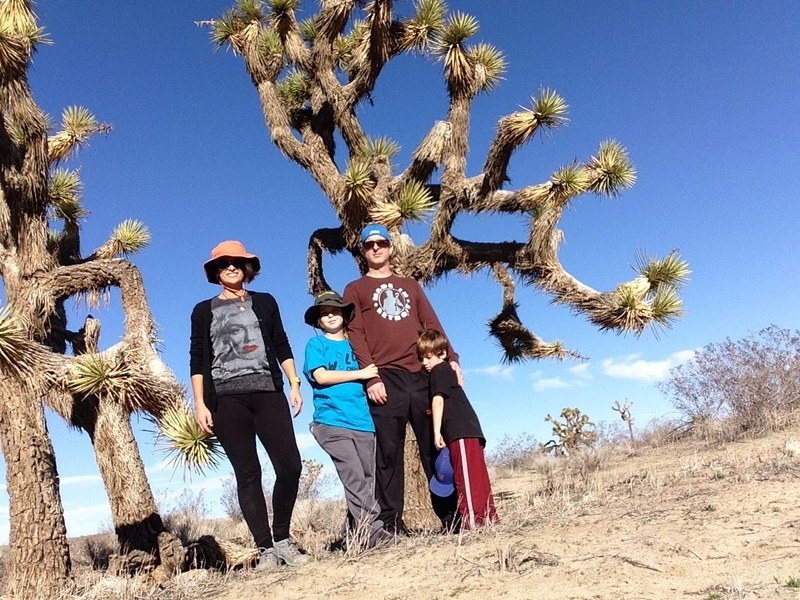 We hiked around amongst Joshua Trees and climbed hills on a moderate 70 degree day. I was even wearing a jacket some of the time. It was strange. When I’m surrounded by Joshua Trees at midday I expect to be panting and trying to find boulders to nap behind until late evening. Instead, we felt free to explore in perfect comfort. It was like getting a free pass. It was just wonderful. This is my favorite picture from the day. 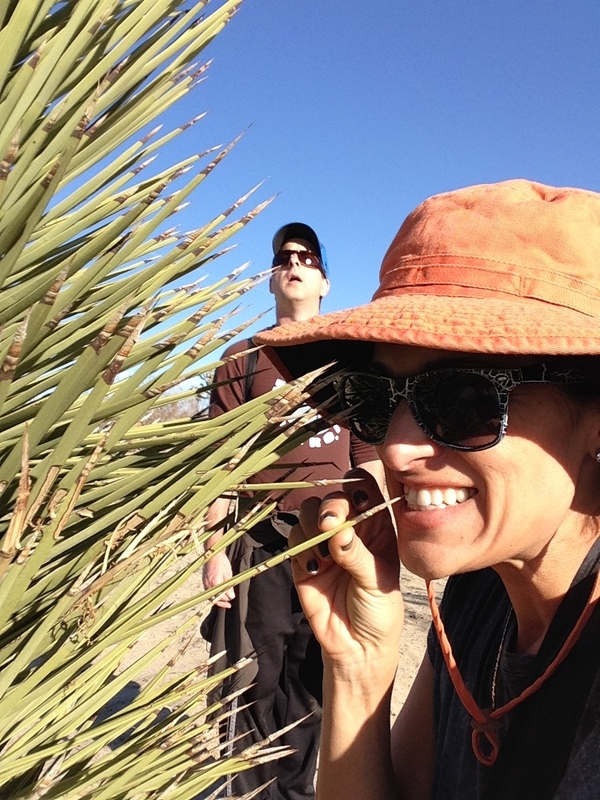 The kids and I stopped to clean our teeth on “the toothpick tree”. I took this photo and caught my husband rolling his eyes at me. LOL! It isn’t safe to try to be sneaky in the digital age! Prev Janathon: Blog, log jog!